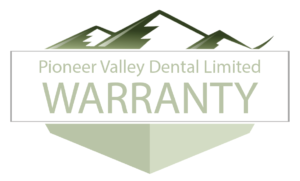 Our friendly staff at Pioneer Valley Dental takes great pride in both the quality of treatment that we provide and in the materials we use to do it. Many of our patients ask, “How long will this work last?” It’s a valid question. In most cases we warranty our work for 3 to 5 years—depending on the treatment. Please call for more details or set up an appointment and we’ll consult with you on your dental needs.